I hate it when the prediction by the heart beats the one by the mind because that means Arsenal have put in a logic defying performance or committed suicide with some horrible individual errors. In this case it was a bit of both. Before going further let me just acknowledge that Birmingham thoroughly deserved this win for the effort they put in, for their keeper making some big saves, and for taking their chances. Credit also to Mike Dean who, in this game, did as good a job of being fair as any ref I’ve seen in England. If anything, Birmingham have genuine complaints for not getting a penalty in the second minute but that was down to the assistant ref. Whether it would have given them a bigger advantage or roused Arsenal up earlier will never be known. I thought the Gunners were extremely nervous at the start and this allowed Birmingham to gain the early initiative. Clichy seems to have developed a bad habit of dropping a yard behind the defensive line. That allowed Bowyer to sneak in behind the defence and should have won a penalty when Szczesny brought him down with a clumsy attempt. I don’t think it would have been a red card as the player was going away from goal and there was a defender coming back but in such cases it’s difficult to say what the ref would have given. The midfield with the exception of Wilshere was extremely poor in the first half. They hardly won any knock-downs and that allowed Birmingham to get out of their half easily and made it easy for them to sustain some pressure in attacking areas. At the other end Arsenal were creating some half chances but nothing more. Rosicky and Arshavin just didn’t do enough. The first goal came from a corner after Koscielny headed a ball out. That ball was so far inside the six yard box when the defender headed it that one wonders why the goalkeeper didn’t take charge of it. It should have been Szczesny’s ball but ended up as a corner for the Blues. The ball was swung wide and a Birmingham defender won it 15 yards from goal. His header was directed back towards the middle of the goal and Zigic was able to use his height to guide it in past a woefully flapping Szczesny. Arsenal’s response was good. Van Persie went close with a header after a good cross from Sagna. Birmingham then had a good spell for five minutes in which they could have scored again. A decent save from Szczesny denied Zigic was was again through. The equalizer came from some good work by Wilshere who brought the ball forward for a quick break. When it came back to the youngster he rattle the bar with a thunderbolt. Arshavin controlled the loose ball and beat off the pressure from two players to deliver a wonderful cross. The finish from Van Persie was exquisite. Arsenal dominated the rest of the first half with Nasri drawing a big save from Foster but the teams went in level at the break. In the second half there was a distinct difference in the way Arsenal played. The midfield stayed much closer to the defence and the shape of the team was a lot more compact. Birmingham did get some joy down their right but didn’t really force Szczesny into making any great saves. Even then there were some moments of confusion at the back as Djourou looked clueless and Song showed no composure at key moments. Fahey rattled the bar when he should have buried his chance. At the other end Arsenal were sniffing around without testing Foster until Bendtner came on for RvP. After that Foster made four good saves from Nasri, Bendtner, Rosicky, and Nasri. Birmingham were on the back foot and the Gunners had all the momentum. When it all looked positive Arsenal shot themselves in the foot. Djourou lost another aerial battle with Zigic off a long ball as both central defenders had done all day. It shouldn’t have mattered as the ball was going harmlessly towards Szczesny. Koscielny was covering behind Djourou and was about to clear the ball when Szczesny called for it. I thought it was a very late decision from the Keeper and that confused the defender who pulled out of his clearance at the last moment. The ball did get a deflection of Koscienly but Szczesny should have kept his eye on it. The Keeper lost his bearings at the crucial moment and the ball just rolled towards Martins who’d not have scored an easier goal in his life. People like to blame some individuals and big up the others. But this game showed there are some fundamental flaws with the way Arsenal defend and it’s not an individual problem. Of course, the players on the pitch will be the ones who get it wrong but the root of the problem is in the way this team sets up to defend the aerial balls. It cannot be solved without a change in the coaching staff. I put this defeat down to three factors – poor defensive organization and intelligence leading to individual errors (coaching issue), experienced players underperforming, and limitations of the tactical system being exposed by aforementioned individual errors and poor off the ball movement. The last one is a complex issue and I’ll discuss that separately. Of course, it was a close game and all this would have been forgotten if one of Nasri’s shots had gone through or Szczesny had done better. But it should never have been a close game against Birmingham and therein lays the real problem. My mind knows Arsenal could have done much better but the heart is surviving only because it was prepared for the worst. Szczesny: Two horrible mistakes but just as I’ve defended Almunia and Fabianski when they’ve made such errors I will not put all the blame on the youngster. Sagna: Very nervous start as he didn’t do well early on. Crossing was good. Much better in the second half but not enough. Djourou: Very, very shaky all through the game. Struggled against the aerial ball. Did make some important clearances. Didn’t do enough with the ball in phases when Birmingham were sitting deep. Koscielny: Couldn’t win the aerial battle with Zigic but that was expected. Better composure and distribution than Djourou. Should have cleared the ball despite the call by the Keeper late on. Clichy: Struggled down the left as the midfield and Arshavin didn’t support him well enough. Was better in the second half as the team played a more compact game. Needs to make sure he doesn’t end up being deeper than all other defenders. After some really convincing recent performances the back five was extremely poor in this game. I put it down to the nerves and the fact that the midfield just wasn’t reading the game defensively. Too many runs were not tracked and that put the defenders in awkward positions. Goalkeeper had a night to forget but one he probably will never do. Song: Awful is the word that comes to mind for his first half performance. Was marginally better in the second half but nowhere near the level we’ve come to expect. Chased the ball like a madman but lacked intelligence in his positioning, movement, and passing. Wilshere: One of the two players who can come out of this game without a negative. Handled the pressure well, used the ball intelligently, and contributed to attack and defence. Rosicky: MIA for large periods of the game. Should have dropped deep a lot more and should have helped in moving the ball with simple passes and by being available to receive those passes. Exact opposite of Wilshere as Little Mozart was the least useful player on the pitch. The midfield just didn’t do enough in the first half as they were often caught in a no man’s land. Song has had two consecutive poor games. I hope he can regain his form soon as he is a key player for the team. Arsene has to get more out of the likes of Rosicky whose poor display put extra burden on Wilshere and consequently on Clichy. Nasri: Another one who can hold his head high. Worked hard, created chances, troubled the Keeper a lot. Can’t blame his for the performance of the result. RvP: Good composure on the ball, good movement, excellent finish. Disappointing delivery on set plays and should have offered a bit more in attacking areas. Arshavin: Excellent assist but pretty off colour otherwise. I thought the attackers didn’t get enough chances the link between them and the defence wasn’t very good in the first half. The understanding between the three wasn’t that great either. The weakness of the tactical system meant that Arsenal could not utilize the spaces in behind even when Birmingham pushed forward. Subs: Bendtner created one chance out of nothing but didn’t get on the ball in the box as often as I’d have liked. Chamakh too worked the channels a lot more and wasn’t in the box as often as I’d have liked. Once again it was the weakness of the system that couldn’t get more from either of the big strikers. Wenger: Starting line-up wasn’t the best but it wasn’t too bad. The manager must have given the right instructions at half time as the team showed a better shape in the second half. I don’t know the reasons behind the substitutions but I’d have picked Eboue ahead of Chamakh as he can run at the defenders. The manager can’t do much when the players make such individual mistakes but his team doesn’t deal with these situations well enough and it’s not down to one player so Le Boss has to take the blame. It’s back to square one now. How the players react will tell us a lot about this team and the chances for the future. I know how some fans will react but hopefully that won’t be so bad as to affect the atmosphere at the Emirates. There is a still a lot to play for. So, the big, season-defining game is here. As I mentioned in the last post I’m quite confident and that is making me nervous. If I use my head, everything tells me Arsenal should win this one and rather comfortably at that. But the last few years have thrown up plenty of unpleasant surprises and the heart is a wary, somewhat sceptical creature these days. Tactically, I expect to see a Blue bus parked inside Wembley. Mcleish is likely to go with a 4-5-1 and it will be interesting to see whether he picks the pacy Martins or the big man Zigic up front. I won’t be surprised if the Scot starts with a quick forward looking to play on the counter. He can bring the big man later on. Birmingham are a unique team in that they have this tendency of putting up a serious challenge in the final 10-15 minutes. They’ve overturned a goal deficit against the big teams with their late push and Arsenal will need to score early to counter that. As we saw at St. Andrews an early goal will force them out and the Gunners will get a lot more room for their creative play. That way Wenger’s team could establish a bigger lead before the final quarter-hour of the game. Obviously, that means Arsenal need to start the game positively and at a high tempo just as they’ve been doing recently. After the first goal they can slow down a bit but must use the ball and space more intelligently to create clear chances on the break. With Mike Dean in charge the players will have to be prepared to win against 12 men. It will be a tough mental test and we need to see the Arsenal that overcame abysmal refereeing against Everton and Stoke and not the one that succumbed at Newcastle. While the team as a whole has to be mentally tough, it is also an individual characteristic. So it will be interesting to see if Wenger plays his strongest team or not. In the previous Carling Cup games Arsene has made some changes to the starting eleven but I’d like to see the strongest team for this one. At the back that would mean Koscielny coming in for Squillaci and no other changes. Eboue and Gibbs will have to be satisfied with a place on the bench. Up front I’d like to see Arshavin on the left where he can trouble Stephen Carr who is error prone. RvP, who will captain the side, will be the key figure at the centre of the attack and I’d prefer Nasri on the right. Some might suggest playing Nasri down the middle but to me Nasri and Arshavin on the opposite flanks seems more balanced. I also feel Nasri is at his best on the right. Picking the midfield will be a challenge in the absence of Cesc. The simpler option would be to bring Rosicky in for El Capitan in front of Wilshere and Song. I’d prefer to see Wilshere in a more advanced role with Song and Diaby behind him. That will also give Arsenal a stronger physical presence on set-pieces. I don’t think the trio, Song-Wilshere-Diaby, have ever started any game this season so it might be suggested that this is not the right time to experiment. I will trust Wenger’s judgement on that. Szczesny – Sagna, Djourou, Koscielny, Clichy – Song, Wilshere, Diaby – Arshavin, RvP, Nasri. If Arsenal can repeat the defensive performance that we saw against Stoke, I can see the Gunners keeping a clean sheet. That will be some achievement as Birmingham have showed good form in Cup games. I really want to see a focussed and confident display for 90 minutes even if the ref favours the opponents and the players are roughed up. Arsenal must not show signs of confusion and weakness in their play as it can lead to a negative cycle – the opponents get fired up while the Gunners start making individual mistakes. After that the ball just keeps coming into the Arsenal box giving the ref enough chances to blow for a penalty or for an opponent to get lucky with a tap-in. This will be possible if the players keep their concentration on the football and not on the result or its implications. I have a feeling Van Persie’s delivery on set-pieces and his sharpness in and around the box will make a big difference. Wilshere should also show he is ready to take some load off Fabregas. Prediction by my mind is a 3-1 win for Arsenal but my heart is afraid it will be heart-break after extra-time. Ultimately, my backside is bearing the brunt of sitting on an uncomfortable fence but thankfully the wait is not a long one. This has been a strange season in some ways. The games that I thought, and I’m sure many would agree, to be bankers turned into surprise defeats; Newcastle and West Brom at home for instance. On the other hand, the Gunners have pulled of some inspiring victories in tough games where only the most optimistic of supporters would have expected a win; Barcelona at home and City away are two good examples. So please forgive my consternation when this thought popped into my head – “The Carling Cup final should be a comfortable win!” I don’t think I can explain this to anyone who hasn’t experienced it on their own but feeling nervous because you’re confident can be a really crazy state to be in. One thought led to another and finally I arrived at the question that has been ignored by many – What if Arsenal don’t win the Carling Cup? Not a pleasant thought I know but one that has passed through many fans’ minds, no? Arsenal have been projected as overwhelming favourites for this game and even the Misery Brigade seem to have taken this title for granted. A cynic would say it’s all set up for one giant humpty-dumptyesque fall. But we all know Cup ties can be a difficult beast to conquer at the best of times. Throw in a pantomime villain like Dean into the picture and the real odds for success do look different from the peanuts that the bookmakers are offering. Don’t get me wrong, I’m not trying to discourage the believers or predicting a loss. I’m just wondering what if. Personally speaking, I don’t really mind whether Arsenal get silverware or not. That will never be the priority in my way of thinking. As long as the players give everything I’ll happily take the result. Well not exactly gleefully, for if the ref steals if from Arsenal and hands it over to Birmingham it would be very hard to take, but what I mean is that I’d not blame the Gunners for not winning silverware. In football, when you lose you have to accept defeat. But what is important when you go into a Final is that you give absolutely everything. You do not want to go into a Final with fear that if you lose it will be dramatic. What you want is to go into the final and give everything to win it and that is how we approach the game. For a man of Wenger’s abilities and experience these words make a lot of sense and I agree with that approach to the game wholeheartedly. But will the players be able to show the same level of maturity, especially when sections of the fans and almost the entire media will turn on them in the event of a failure? Ideally we would want to see a positive result leading to a turbo charged run-in. Winning the final will certainly provide that. There is not much to think in such a case. It’d be a positive emotional drive that will carry the players onwards and upwards. In contrast, one would need incredible mental resilience to counter the negativity in case of an adverse result. The team would still have to move forward but it will have to be against the direction of the emotional pull. The mental strength of the fans will also be tested. If people can actually criticize the team after such a hard fought win over Stoke I shudder at the thought of the mindless reactions a loss will evoke. Of course, the best way for the players to respond will be to go out and perform in the next game. The atmosphere for that will be negatively charged but the Gunners will just have to see it as an additional challenge. So far this season I have been incensed by some performances and results but on the whole I’m really proud of the way this squad has performed. If the players feel the same way they’ll be able to overcome any negativity surrounding a loss. I could go on for a while but I don’t want to dampen the mood any further. These were just some thoughts I had as my confidence made me anxious. Here’s hoping this is all just in my mind and will not turn into reality. Calculated Violence – The Latest Trick In Anti-Football? Over the last few years we have seen quite a few new tricks evolved by the exponents of anti-football. Rotational fouling and rotational time-wasting are two of the most commonly seen ones. After watching the last game against Stoke I have a feeling we are going to see another trick join the list – ‘World’s most successful anti-football tactics’. Let me illustrate this by analyzing the attack on Djourou by John Carew. As we can see from that image, when the Swiss defender plays the ball the Norwegian is more than two yards away. It wasn’t a 50-50 tackle it was a 100-0 by anyone’s honest reckoning. No surprise then that the ball is over five yards away when Carew clatters into Arsenal’s centre-back. There are two aspects to this attack – what Carew could have done if he actually wanted to play football? And What Carew actually did. If the Stoke striker had any intention of playing the ball he could have easily done so. In the above close up we can see that Djourou has already played the ball as Carew is charging at him. Not only has the defender played the ball he has also pulled his leg out for fear of receiving an ugly stomp from the big man. If Carew wanted to, he could have landed on his right leg, dropped his left shoulder and changed direction towards the ball. If you look back to the other images above, there is a big gap between Djourou and Clichy and the defender didn’t get enough power on the ball as he was looking to pull his foot out. Carew could actually have won the ball and charged into the box. I have played a lot of sports at amateur/college levels and can say with confidence that changing direction is not that big a deal, certainly shouldn’t be for professional footballers. If he had any positive intentions he would also have been anticipating such a touch by Djourou and actively seeking to exploit it. We have seen enough examples of quality football from the striker prior to his Stoke days to know that he can do it if he wants to. That leads me to believe that he had no intention of playing the ball. This brings me to the second part. What was John Carew trying to do? I was a sports nut while growing up and one of the sports (although now I don’t consider it a sport) that I followed was WWE (WWF as it was known in those days). Carew’s charge reminded me of the term Clothesline that was quite common in that. I just Googled it and found this description of how to perform a clothesline attack. Face your opponent, about five feet away from them. A good clothesline has a lot of power so get some momentum going. Bend your knees and be ready for action. Charge at your opponent as quickly as you can. The faster you go, the more force there will be in your clothesline. Put your dominant arm out to the side of your body. If you are right handed, then stay about a foot to the left of your opponent. Swing your arm and try to hit your opponent in the chest with your forearm. Jump to get more power and knock them over. Read that description, look at the earlier images in the article, and the final image above. I believe John Carew gave us the perfect tutorial on how to deliver a clothesline. The purpose of this was two-fold. Early on in the second half it tested the resolve of the ref. Once it was clear the ref is allowing such an assault to go unpunished Stoke were motivated to go at the Gunners in every manner possible. The second point to this is to rattle the individual. No matter how strong Djourou is, such a blow to the diaphragm would leave him winded. He would continue to feel the effects of the hit for the next few minutes and there is a chance that he could lose concentration. Another advantage for Stoke would be that the defender would be hurt and wary of going into another such challenge knowing fully well that he won’t be protected by the ref. Spread this around i.e. different players assaulting different opponents, and you’d undoubtedly make an impact on the other team’s ability to play football. Make no mistake about it, Arsenal are going to face more and more of this ‘Calculated Violence’ till the end of the season. On a related side note I also wanted to discuss some of the lies spewed by Tony Pulis. Let’s not worry about his attempts of trivializing the discussion by talking about the card counts of the two teams. This game itself was a good example of how Stoke get away with shocking challenges that renders any discussion based on the number of cards received meaningless. It’s a shame that no one in the media has the guts to question Pulis about this. But this is something we have heard often enough and isn’t worth dwelling on. More interesting was the Stoke manager’s comment about his team’s honesty. We are a very honest team. Jermaine Pennant showed that second half when he was tackled and he got straight up. We do that at this football club. We don’t like people rolling around or seeing people trying to get players booked or sent off. It’s traditional but it’s the way we like to do things at this club. In the first half Bendtner attempted a sliding tackle that was deemed to be a foul by the ref. I thought the Dane got the ball but since it was a little bit from behind it could have been considered a foul. If we look at the details it’s a very decent attempt. Bendtner ensures his laces were facing the opponent and not his studs. He also had his other leg tucked in below him to cut out any chances of a scissor action. Even his leg movement was going across him and not in the direction of his body weight/momentum. Unfortunately, these are the kind of technical details that no one in the media seems to focus on when discussing good or bad tackles. Pennant, for his part, went to ground far too easily, rolled on the pitch twice, and was holding his shin as if it had been hacked off. Even in the second half, Clichy actually won the ball and Pennant went down far too easily, that is if we apply the same standards that people impose on Arsenal. An honest and traditional club indeed. They seem to have a tradition of violence and cheating and seem to follow it honestly, nay, religiously. Well, at least they can consider themselves the world’s best at something. I don’t know who pioneered this art of ‘Calculated Violence’ but Stoke have perfected it. Peter Walton tried his best. He did get manage to get the scalp of Walcott, who was stretchered off with what appeared to be a serious injury, but couldn’t do enough to thwart the indomitable, resolute Gunners. This game had everything I feared; rabid animals from Stoke, a biased ref, and hypocritical commentators. Thankfully it also had one thing I truly hoped for – a fully focussed Arsenal side that did not switch off even for an instance. That, when combined with the quality that Arsenal have, is normally enough to take on and defeat the worst English football has to offer and it just highlighted the indescribable gulf in class between the two sides. I didn’t get to watch the first half properly as every stream I found was stop-start. But I was able to watch enough to enjoy the electric start by Arsenal and the first goal. The start was a little unexpected. I’d the feeling the visitors will start pressing at a higher tempo but they were content on sitting back. Arsenal seized the initiative and Theo rattled the woodwork just after a minute. The Gunners kept creating chances but the goal in the 8th minute was ironical. Who’d have thought that Arsenal would actually score against Stoke from a corner! Wilshere’s delivery was excellent and for once Arsenal had a man at the back post. Bendtner did well to control the ball and even better to pass it back across the face of the goal rather than lashing it across. Squillaci was unmarked and scored from four yards. That’s how you score a legal goal from a set-piece but I doubt Stoke will care to learn. Soon after Cesc limped off and Arshavin came on. It was supposedly a precautionary substitution but it did make a huge impact on the game. For the rest of the first half Arsenal dominated the ball but didn’t really create many chances. I thought the tempo was too slow and Arsenal’s passing and movement was too predictable. Arshavin, Bendtner, and Walcott haven’t played together often enough and that showed in the final third. Even Nasri was struggling to influence the game as the movement in front of him wasn’t up to scratch. I don’t know what happened in the tunnel at half-time but Stoke came out in the second half knowing that they could assault the Arsenal players with impunity. Carew flattened Djourou with a shocking challenge that was so late it was virtually off the ball. All he got from Peter Walton was a, “Well done, lad. Don’t do it again or I might have to book you just to keep my cover.” Next it was Nasri who took one in the ribs but this time the ref didn’t even blow for a foul. I guess getting within two feet of the ball was enough of a justification for a deliberate elbow in the ribs. Soon after Delap did a Flamini and got away with it as ‘he got the ball’. I didn’t hear the commentators say it was an absolute disgrace. All these challenges happened in the first ten minutes of the half and set the tone for the rest of the game. It would be unfair on Walton to say that Stoke won all 50-50 calls. They won even 20-80 calls. If a Stoke player shoved a Gunner out of possession it was fair. If an Arsenal player herded an animal out of the way it was a foul. If Stoke got the ball by kicking through a player it was a fair tackle. If the Gunners did it, it was a free-kick. Clichy was booked for winning the ball! Things got so bad that I almost expected Walton to award a penalty when Shawcross grappled Sagna to the floor. Thankfully it was too blatant even for a ref as biased as this old geezer. Theo was injured in the 70th minute when Walton allowed Whitehead to nibble away at his legs and shirt. There were a number of fouls by Whitehead in that incident and if the first one had been called this injury would not have happened. Somebody has to make the ref explain in public what he was doing but we can all guess that will unravel the supposed integrity of League. In the 84th minute Marc Wilson picked up a booking for a stupid foul on Chamakh wide on the left. Pulis, who was right next to him on the touchline, was shouting “Don’t foul, don’t foul.” Sadly for the zoo keeper his instructions in the heat of the moment weren’t able to override the instructions he gave before opening the cages. In the very little football that was played, Arsenal did have some nervy moments but did well while defending the throws and set-pieces. I can only remember Szczesny flapping on one occasion when Huth headed over and one header from Shawcross that was deflected wide as Djourou was well positioned. 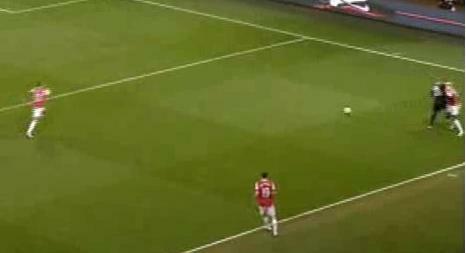 On the other end Walcott missed a good chance when Arshavin set him up. The best part of the game came in the form of a masterclass by Arshavin and Nasri in the five minutes of injury time. Stoke barely touched the ball in that period as two highly skilled artists toyed with their opponents. If Arshavin had been alert to the possibility of scoring, deep in injury time, he’d have had a tap in from Nasri’s delightful chip across goal. As expected this game was a tight one and decided by one goal. I was hoping to see all players come off with their limbs intact but that wish was not granted. Only time will tell how big an impact this injury will have on this season. Szczesny: Made an excellent save in the first half. Organized the defence well. A couple of punches didn’t have enough weight but they fell to his teammates. Flapped once but Huth missed the target. Overall a strong, confidence boosting display from the youngster that should prepare him for a much tougher away game. Sagna: Did well at the back. Wisely, didn’t go forward that often in the second half. Might have done better in the attacking areas but that can be said for the whole team. Squillaci: Good to see him get his first Premiership goal. Handled the physical challenges well enough. Carew won the balls in front of him but the Frenchman didn’t let him turn or get past him. Djourou: Strong in the air. Good positioning and composure while defending set-pieces. Clichy: Pretty much like Sagna. Was exposed a bit after Arshavin came on but did a good job of not giving Pennant any space. The back five deserve a lot of credit for this result and their second half performance. I’d have preferred better attacking contribution from the full-backs and the central defenders when they got a lot of time on the ball in the first half. Song: Was always available to challenge for the second ball. Worked really hard in defence. Went forward often enough but wasn’t able to create a spark. Cesc: Was looking dangerous before he came off. Nasri: Wasn’t as influential down the middle as he is on the wings. It could be due to unfamiliarity with the position and the fact that in the middle we need someone who moves the ball fast rather than a player who runs with the ball. He was quite a threat when he moved back to the right wing. Excellent in the final few minutes. Did well to remain composed despite suffering some bad tackles. Wilshere: Started where he’d left off against Barcelona. But once Cesc was off the pitch Wilshere went into his shell a bit and played with caution. Did well on the ball and offered a body in the box and on the left wing. The midfield should have done a lot more in the first half but it’s hard to criticize them when the spine of the team (Koscielny, Cesc, RvP) was missing. They must be commended for their defensive concentration and effort. Walcott: Another player who looked very dangerous when Fabregas was on the pitch. After that the tempo of the game was slow and it allowed Stoke to close him down with numbers. Might have done better with the chance that Arshavin created. Really unlucky to suffer an injury when he should have won a dangerous free-kick. Bendtner: He was excellent for most of the game and his physical presence made a big difference. Won the corner by outmuscling Huth, which is no mean feat. Showed good awareness and composure to pick up the assist. Also contributed to the defence on set-pieces. Arshavin: I expected more inspiration from the Russian in the first half but overall he worked hard and made a difference. Really took charge of the situation at the end. The front three were a little unbalanced after Arshavin came on. They also lacked understanding of each others’ movement. They’ll need to do a lot better in the upcoming games if Cesc and RvP are missing. Subs: I’ve already covered Arshavin. Denilson was decent in keeping possession and stayed close to the defence. Chamakh was a strange one and didn’t get much time. Wenger: I liked the way he stayed away from commenting on the ref at the end of the game. Even the players will have to realize that criticizing these ‘sold-out’ relics will only harm Arsenal’s chances even further. While Arshavin did fairly well, I’d have brought on Denilson or Rosicky for Cesc to maintain the balance of the team. I thought Arsene wanted his best players on the pitch but sometimes it doesn’t work. Since the manager is criticized for his selections when the result is not good he deserves credit when the game is won. I don’t know if I can ever dislike a football team any more than I do Stoke City. Fat Sam’s teams run them close as do Birmingham. But none of those teams can quite reach the level of Arsenal’s next opponents. Dislike is actually a really mild word for my feelings towards Tony Pulis and his bunch of thugs. But I’ll try to keep my feelings out of this and try to focus on the football/rugby. Van Persie and Koscielny have been ruled out of this one. I guess both were unavailable for the FA Cup tie as well but it never came up because of the rotation. That does explain the inclusion of Miquel. More importantly, we are likely to see a centre-back pairing of Squillaci and Djourou against Stoke. These two haven’t played together that often but have done well in the few games that they’ve played. I also expect Sagna to keep his place while Clichy and Szczesny should come back into the starting eleven. This game will be the first time the young Pole comes up against players who will foul him at every opportunity. It will be intriguing to see how he handles that. If he can dominate his box in this game, something that will be needed given the strengths of the opposition, he will have passed his toughest test yet, even tougher than Barcelona as this one will involve illegal challenges. Luckily for him this is a home game and Stoke don’t do that well away from home. Even then I expect the youngster to be quite busy, especially early on. The midfield should see the first choice trio, Song-Cesc-Wilshere, back together. Up front Nasri and Walcott should have a different striker between them. I’d go for Bendtner ahead of Chamakh as the Dane has already played and done well against these thugs. His physical presence will be an asset in both boxes. Tactically, the initial exchanges will be extremely important. The Gunners have to go out on the pitch and show that they are ready for the battle. The visitors will look for any signs of weakness, and if the Arsenal players aren’t fully committed in the 50-50 challenges or individual battles, it will give them a boost. Le Boss stressed on the importance of dominating possession in such a game and it’s not difficult to see why. Stoke will try to play the long balls down the channels in an effort to win free-kicks, corners, and throws in the attacking areas. Arsenal have to keep them pinned back and minimize the number of men they can get forward. Stoke do have one genuine quality and that is their defensive organization and work ethic. It will not be easy for Arsenal to open them up. Van Persie will be dearly missed in this game but I’m hoping Bendtner will deliver in a central role as he did in the away game last season. Some good quality crosses from Sagna and Walcott will certainly help. Arsene might pick Chamakh but it will be a mistake in my opinion. There will be more than usual grappling in the penalty box. I can only hope the Arsenal players will not lose concentration as the ball is flying around. Conceding a soft goal to an unmarked player at the back post is most infuriating. The smaller players can do their part while defending set-pieces if they are alert to the knock-ons and loose balls. I’d also like to see the central defenders take charge of the balls being hoofed down the wings. They should reach them ahead of the strikers and should try to keep possession under pressure. Hoofing it up-field or kicking it out will only motivate the opposition. I’m not sure whether Lee Mason, who was supposed to officiate the original fixture in Dec, will be the one to take charge of this game or not. I will be worried if it is Mason. Arsenal have done fairly well at home against Stoke who are not good travellers but I expect this game to be close with no more than 1 goal separating the sides. A bigger win will be a mighty impressive performance from the Gunners and will only be possible if Cesc has a brilliant game. I don’t want to dwell on the possibility of a loss but it is possible if Arsenal don’t turn up with the attitude of defeating 12/13 men. More than the result though, I’d like to see all the players come through with their limbs intact. I had mixed feelings after this one. The primary one was exasperation. But I also saw a team of players who haven’t played together work hard and play with the right attitude. It’s not easy to play the Arsenal way with so many of the starting eleven being non-regulars. For large parts of the game Arsenal went forward and controlled the game without really creating gilt-edged chances. The passing, movement, and most importantly, understanding in the final third was missing. That led to a number of hopeful shots from outside the box at inopportune moments. Most of these went wide and one or two drew a simple save. Chamakh had the two best chances, one he side-footed into the arms of the keeper while the other was just beyond his stretch but he should have been anticipating it better. Since it came from a cross it again left me wondering how often do Arsenal practice this. The performance in the second half was better. Rosicky finally broke his drought with a brilliant header after some good work by Bendtner. Little Mozart had another chance soon after but the Keeper saved well. In general Arsenal got in behind on a couple of occasions and should have scored the second. As has become usual, once the opponents started showing some attacking ambitions, the Gunners looked a bit confused at times or were caught off-guard. Leyton Orient never managed to dominate the ball but created enough intelligent moves to start getting a sight of goal and get their hopes up. One snap-shot from the edge of the box went wide of the post. The next one was saved by a block by Squillaci that cost him his senses for a short period. The goal came after the substitute striker, Tehoue, burst in-between Miquel and Gibbs before firing past the hapless Almunia. I haven’t seen it again and wasn’t focusing very hard on this game so I don’t want to proffer strong opinions but all three moves came down our left. Gibbs was often out of position as he went forward without considering the priorities. Even tactically the left axis of Gibbs – Denilson – Arshavin was quite weak. Since Orient never really tried hard to attack they were comfortable for the first hour or so but once the home side showed some intent we struggled down the left. This was compounded by having a young kid, Miquel, on the left side of central defence. By and large he was impressive but the mistake for the goal was a typical rookie mistake. No striker should ever get between the left-back and the central defender in that manner. Miquel was caught ball watching at the worst possible position and time. The goal came too late for Arsenal to regain the lead. This result will undoubtedly bring over the top criticism for some players but I feel it’s good that Arsenal can put out such a team and play the way they did. I saw United against Crawley town and they were under pressure for a much longer period against a far weaker team. The goal came from having two youngsters in defence and not giving them the right cover. We can say that it’s a tactical mistake but we can also say it’s the kind of lesson these kids would otherwise not have received. Even the experienced midfield got caught out a bit when the free-kick was taken short and that is a bigger concern in my opinion. We now have an extra fixture but I feel, given the way we can make so many changes, the home game should be a good opportunity for the second string to get another chance of gelling together. Almunia: I guess many will take the easy route of bashing the most criticized player in the squad. I have seen Given and Reina concede this way so I won’t blame the Keeper. Once the striker is through in that manner, when the goalkeeper doesn’t even get a chance to rush forward and cut the angle, it’s almost like saving a penalty. Sagna: Decent game on the right. Orient barely had an attack from that side. Should have done better in attack but we could see he was trying. Squillaci: Not spectacular but did what he had to do. Good block that seemed inadvertent but resulted from good positioning. Miquel: Barring a big mistake for the goal his debut was impressive. Looked composed on the ball, heading was good. Should not be playing at this level as he is always likely to make a mistake in a really dangerous area. Needs to go on loan, to a team where he will face a lot of defensive pressure, to sort those issues out. Gibbs: Went forward quite often. Didn’t always get the ball which showed the players didn’t understand each others’ movements. Needs to focus on defending, especially late on, as that is his primary responsibility. The back five weren’t troubled much so it’s difficult to say whether they did a good job or not. It would have been a decent enough effort but the soft goal spoilt it. Song: Worked hard in a box-to-box manner but his passing was sloppy at times. Should have played on the left side of midfield. Should have stayed much closer to the defence in the final few minutes. Rosicky: Another one who put in a lot of effort. Came deep to collect the ball, tried to create opportunities for others, took his goal really well, MotM if anyone deserves it in such a game. Denilson: A very limited performance. Didn’t offer anything in attack. Didn’t even take charge of the midfield to spray the ball around as the opponents sat back. Keeping things simple against such a team is wasteful because it’s like playing into their hands. The midfield saw a lot of the ball but didn’t create enough. Song was sloppy. Rosicky didn’t always have the right understanding with Arshavin. Denilson must have been the dream player for the hosts. Bendtner: Can’t fault him for work rate. Dropped back, came in centrally, ran with and without the ball. Shooting was rushed and scuffed. Good work for the assist. Chamakh: Very rusty and disappointing. Like Denilson didn’t do enough in midfield, Chamakh didn’t do enough in attack. He looks completely confused and doesn’t seem to know when he should take the initiative and when to play for the team. Arshavin: Had moments of inspiration when he tried to create something but mostly it wasn’t his day. Even then he forced a decent save and hit the post. Should have shown better composure late on in the game. The attacking players were not on the same wavelength. There should have been more runs in behind the defence or more bodies getting into the box as the opponents were set out to defend. Wenger: I would have preferred Song on the left and Denilson on the right from the start. Since most of the game was easy it didn’t seem relevant but to me it’s a matter of maintaining the right balance. I also wanted to see a clear counter-attacking approach from Arsenal in the final 15-20 minutes but the players kept playing the slow build-up game. Substitutions might have made a difference but we need to win such games with the team we’d put out. At least this game served the purpose of resting the key players ahead of a tough game against Stoke. If the result in that one is positive this game will be forgotten. You are currently browsing the Desi Gunner blog archives for February, 2011.